The Google Summer of Code 2010 is on and once again, Eclipse has been accepted as a mentoring organization. If you want to contribute to Eclipse, build a great project, and get more involved with the Eclipse community – all as a summer job paid by Google – then check out the ideas page and apply. I was a SOC student at Eclipse last year and it has been an awesome experience! After completing my project, I wanted to create and spread some SOC swag and had stickers printed from the official Eclipse SOC logo. Since it was the first time I did this, after sending multiple different sizes of the logo, the sticker shop gave up on me and just sent me the double amount I had ordered, but uncut. So even after flooding both Ian Bull (my SOC mentor) and Gen Nishimura (the original logo creator) with real-world postal sticker spam, I still have plenty left! 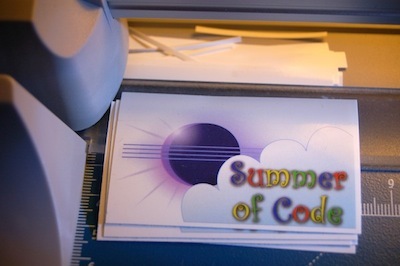 So if you’d like your own Eclipse Summer of Code stickers, hand-cut by a genuine Eclipse SOC student, just mail me your address, and I’ll be happy to ship you some. Cool stickers! You should probably send some to the Eclipse Foundation so they can give them out when they go places. Try to track down wayne@eclipse.org and see what he thinks. Chris, that’s a nice idea, and if they’d all be cut already I’d do that right away – as they are not, I’ll do cut on demand, at least for now.